Purgatory is one of the shortest golf courses in Indiana when played from the far forward tees. Why bother with three extra sets of tees? The average course length for men is 6,400 and for women is 5,800. However, the average woman golfer only hits the ball 75 percent as far as a man. As a result, the proper tees for the average woman golfer should be 4,800 or less (6,400 x .75 = 4,800). The average low handicap woman hits the ball approximately 85% as far as a man, requiring a length of approximately 5,440 (6,400 x .85 = 5,440). 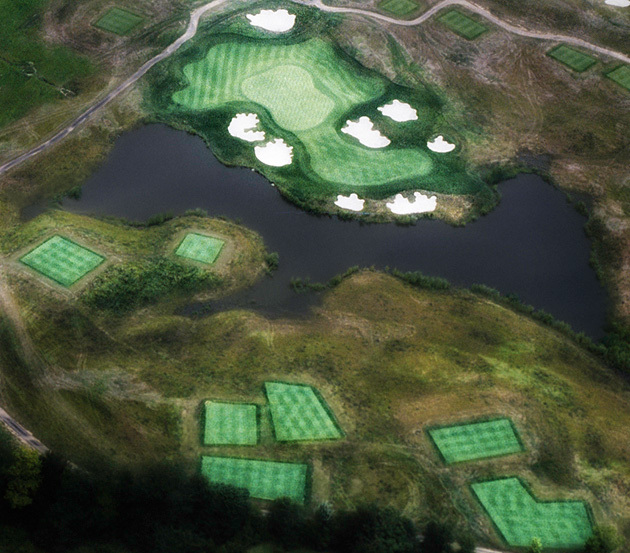 Purgatory Golf Club offers at least six sets of tees on each hole. They are all proper tees, with a sand and peat base. If you have ever played a course that have push up dirt tees for the forward tees, you know it can make it very difficult to get a tee in the ground. At Purgatory you will be able to put your tee in the ground on a forward tee just as easily as on a back tee. The forward tees were leveled with the same patented technology first used at Augusta National, home of the Masters. It provides for a perfect one degree fall. The forward tees are of the formal square type, again, just like the back tees. We do not call our tees men’s, women’s, or senior’s. We simply call them by their color and suggest that guests select the appropriate tee based on handicap. We have had some very good women golfers out here, and we would not insult them by suggesting they play the forward tees. Most courses use red tees for the ladies tees, but we decided to use the red tees as our far back tees. We had much discussion prior to bucking the trend in this respect. It was our conclusion that women would play the proper tee for their handicap, and would not feel required to play a red tee. At Purgatory there are tees that challenge the scratch player, are comfortable to the beginner, and those in between. Each of our six tees are rated by handicap so that a player can automatically know which tee to use. The large number of tees will make it possible for a wide range of golfers to enjoy the course based on their skill level.